How to Benefit from Restaurant Mobile App Development Services? How to Benefit from Restaurant Mobile App Development Services? How to Benefit from Restaurant Mobile App Development Services? Restaurant business is quite dynamic and challenging one. The invasion of technology in restaurant business was not something market leaders had predicted a decade ago. However, the fast penetration of technologies and corresponding real world applications such as restaurant mobile app development, waiter management solution and smart restaurant kitchen has surpassed the expectations and boosted restaurant business to give excellent ROI. This industry has transformed rapidly from merely serving meals to customers that visit the restaurant to allowing them order food online, accessing the menu on website or through restaurant mobile app development services and getting the food delivered at doorstep. In addition to restaurant app development for food ordering purpose, there is demand for apps that enable users to search for different restaurants in the city along with ratings, reviews, photos and details on type of food being served. Get your on-demand delivery app developed to serve the needs of customers of digital age and reap its benefits. Beyond food ordering and delivery, restaurants can leverage the benefit of mobile app by including high-end features and functionalities. Mobile technology can be used to integrate, optimize and streamline all restaurant operations right from calculating the table waitlist turnover to analyzing dinner table order patterns for offering better services to guests. Restaurant managers can access all the information through mobile app and allocate tasks to waiters accordingly. Restaurant management solution helps managers in supervising customer table management, table allotment to waiters and stewards and kitchen order status. The best part about this solution is that managers can access all of this at one place, i.e. mobile app. Accessing and managing restaurant is just few taps away. Restaurants are faced with the challenge of handling requests of large number of customers at the same time. Breakfast, lunch and dinner are peak timings of restaurants when waiters are faced with the dilemma of serving all customers at the right time in a systematic way. In such situations, waiter management mobile solution comes in handy that help in eliminating dependencies of waiters and aligns them systematically to serve customer as per the predefined protocol of the restaurant. Waiters are allocated tables and they can keep track of order given per table, number of items served and number of food items pending to be served. They can even check the kitchen status of food items ordered that are pending to be served to ensure no customers face too long waiting times. Restaurants can save the labor costs and confusion of conveying your food order with specification with the implementation of interactive order placing system. By allowing customers to download the restaurant app and placing the order by self, restaurants can elevate the customer’s experience. It also allows in improving the engagement of customers with the restaurant brand. Synchronization and co-ordination between waiters and kitchen staff is essential for serving guests in the best possible way. With smart kitchen solution, it becomes easier for restaurant staff to keep a track of order received, the ones being processed and picking up those that are ready to be served. This smart kitchen application is usually connected to a monitor that displays table-wise orders data to make it easier for staff to view and act accordingly. Restaurant owners need to study their business carefully and pick up solutions that best fit their requirements. 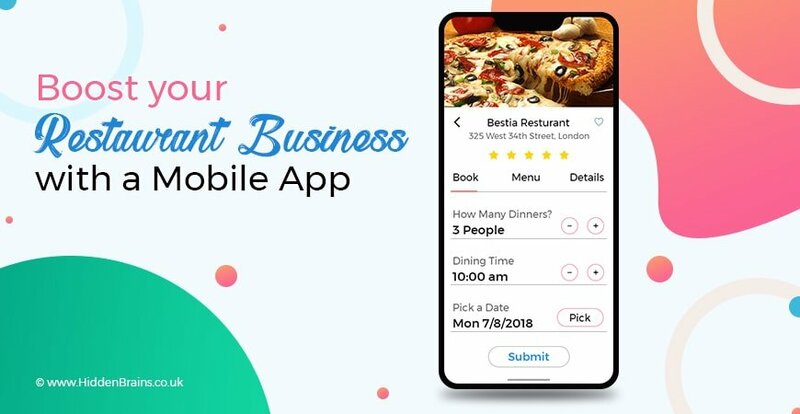 Other advantages of restaurant app include easy management of orders, extreme convenience, building brand value, online food ordering facilitation, expanding business by taking up online orders and collecting genuine reviews and feedback from guests. Hidden Brains is a leading restaurant app development company helping owners to capitalize on their investments with the latest technology solutions. Discuss your restaurant app requirements and know the approximate cost of building it as per your specifications and preferences. To build a restaurant mobile app, request for a free quote now.